Carbon Monoxide poisoning is a real and present danger that is often overlooked in many commercial, industrial, and institutional facilities. At the same time, controlling and protecting against this hazard is relatively easy and affordable if done the right way. The Centers for Disease Control report that over 400 Americans die each year of Carbon Monoxide poisoning; more than 20,000 visit the ER, and over 4,000 are hospitalized . In most cases these hazards can be controlled and avoided with proper education, ventilation, and gas detection. Carbon Monoxide is a byproduct of the combustion of fossil fuels. It is most often a hazard to humans via automobile exhaust, the fumes from industrial equipment and boilers, and from domestic heaters and appliances. Living in the modern, industrialized work in which we live means we are subject to CO fumes on a regular basis. Some of the most obvious commercial hazards are automotive garages, parking garages, and building equipment rooms. Unfortunately, some of these are overlooked at the highest cost. A few years ago in Boone, NC a child died in a motel room from exhaust fumes from a boiler in the space beneath. The family sued the owners for $12 million . While this is so regrettable, accidents of this kind can be avoided. Typically, the method of control for CO is proper detection/analysis, ventilation, and alarm. 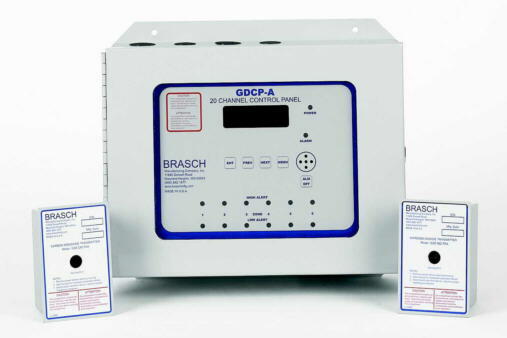 The best type of CO detector for most commercial applications will provide a way to power exhaust fans, an audible alarm, and a readout of CO concentration, typically in parts per million. How to ventilate is always based to some degree on the specifics of the space. Accordingly, how many detectors per square foot, how many fans, alarm levels, etc… will all depend on the specifics of the application.